Officials from POSCO, the Ports of Indiana and community leaders gathered to break ground today on POSCO's new wire rod processing center at the Port of Indiana-Jeffersonville. POSCO is a multinational company headquartered in Pohang, South Korea, and the fifth-largest steel producer in the world. The new $19 million facility is expected to begin operations in 2017 and create up to 60 high-wage jobs by 2018. POSCO is South Korea's fourth largest company, behind Samsung Electronics, SK Holdings and Hyundai Motors, and is ranked No. 162 in Fortune's Global 500. "When a global company like POSCO selects Indiana for its newest plant, it is a strong endorsement of our state's pro-business environment and talented workforce," said Governor Mike Pence. "Our state is leading the nation in manufacturing jobs creation and POSCO's new facility will not only produce new high-wage jobs, but its operations will also generate new business for other port companies." 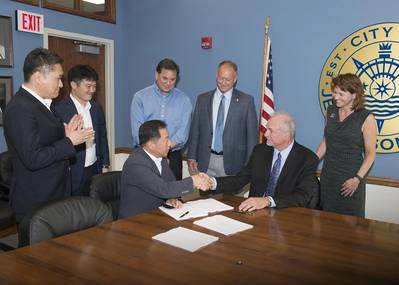 POSCO's Jeffersonville plant will process steel wire for fasteners, nuts and bolts used in the automotive industry and serve as a distribution center for other POSCO products. The project includes a 136,000-square-foot facility to be constructed on approximately 10 acres at the Port of Indiana-Jeffersonville. "It was critical for our new facility to be able to receive steel by barge and be close to major customers in the automotive industry," said POSCO-AAPC President Kenny Hwang. "The Port of Indiana-Jeffersonville's site was ideal for our company because it provides shipping connections to world markets and also allows us to provide just-in-time delivery to our U.S. automotive customers." Other POSCO executives attending the ground-breaking included Wonki Kim, President, POSCO America; Kyu Tae Kim, Finance Director, POSCO-AAPC and Woonhyun Yeo, Sales Director for the new Jeffersonville POSCO facility. During his remarks, Mr. Hwang presented Greater Clark County Schools Superintendent Dr. Andrew Melin with a $2,000 check to support the school's college and career readiness initiative. POSCO was established in South Korea in 1968 and was the first Korean firm to be listed on the New York Stock Exchange in 1994. It operates 312 facilities in 43 countries around the world. "It's an honor to have a world-class company like POSCO chose our port for such an important facility," said Port Director Scott Stewart. "This facility will be critical to POSCO's U.S. operations and could also attract additional investment from similar companies in the future. There are significant logistics benefits from being at the nexus where low-cost river transportation, the auto supply chain and the region's great automakers come together." The Port of Indiana-Jeffersonville is home to 28 businesses, including a "steel campus" of 12 metal-processing companies serving the Midwest auto and appliance industries. The port handled over one million tons of steel cargoes in 2015 and 2.8 million in total shipments.